The annual PNC Christmas Price Index is a giant, interactive infographic on the price tag for The 12 Days of Christmas. The 12 Days of Christmas is the granddaddy of holiday memes. For centuries, the seasonally inclined have sung of that elaborate parade of presents that includes various fowl, prancing performers and, of course, five golden rings. But in these budget-minded times, is it realistic to shell out for any of these gifts? What does a French hen go for these days? For 28 years, U.S. financial institution PNC has made a tradition of calculating the cost of Christmas based on the items included in the classic carol. Borrowing the market basket principles of the commodity price index, the Christmas Price Index is a tongue-in-cheek economic indicator that provides insight into how the price of goods increases or decreases year over year. Economists, presumably, appreciate the whimsy of it and PNC enjoys a PR high when the results are released. Still, no matter how festive the source material, data in itself isn’t exactly cheerful, which is why for the past three years, PNC has tapped the Deutsch agency to bring the index to life. 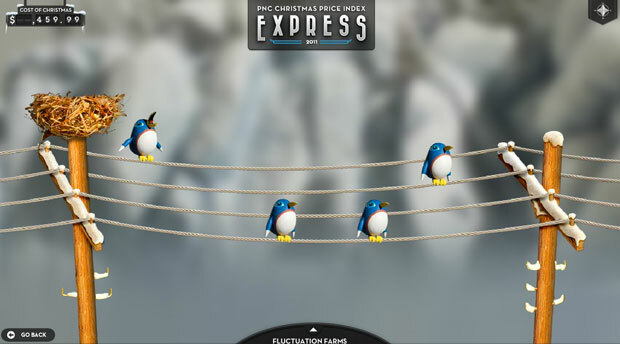 Following a pageant-themed film in 2009 and an interactive animated pop-up book in 2010, Deutsch upped its data visualization game this year with The Christmas Price Index Express. A game-enhanced site with a handmade feel, the Index Express appears as a magical train that carries visitors through an alpine world to collect each of the 12 gifts. But it’s essentially an elaborate interactive infographic, where the data points come to life with animation and sound. To begin the journey, narrator Jim Dunigan, PNC executive vice president, invites visitors to the Christmas Price Index to enter a decked-out department store window. From there, hopping aboard The Index Express is something akin to transporting yourself aboard a miniature train set. 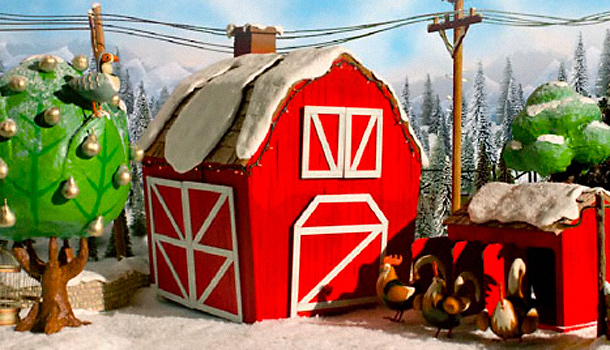 The train travels through snow-covered mountains to four different towns–Fluctuation Farms, Percentage Peak, Index Falls, and Inflation Station–where the current value of each gift is revealed, and each town features a Flash game. Rolling up to Fluctuation Farms reveals that two turtle doves will cost you $125, up 25% from 2010, while at Percentage Peak you’ll have to drop a cool $6,300 to score seven swans-a-swimming. Groups such as the National Aviary, Cincinnati Zoo, and Philadelphia Ballet are consulted to derive the current market price. The depressing aspect of this seasonal exercise is the story the index tells about wages–the poor maids-a-milking’s value of $58 is based on federal minimum wage rates, flat from last year. Deutsch SVP group creative director Jeremy Bernstein says the agency was asked to top the success of last year’s campaign. The goal was to create something with deeper interactive engagement that would appeal to many diverse audiences: economists and the press; teachers who regularly use the information to make basic economic principles understandable; and the general public. While the content of the Christmas Price Index is, at time, sobering, the world itself, which was created in a mere two weeks, is wondrous. Instead of crafting the scenes with CG, director Peter Sluszka and production company Hornet built everything for real. As in, everything. The train was shot live action traveling through a 9×9-foot model, while each town was built in greater detail. Clothes and characters were handmade, some with custom sculpted heads, some with bodies harvested from action figures, all shot in stop-motion. Even the tiny gondolas operating in the background of Percentage Peak were part of the working model, and the Flash games in each town, while computer generated, feature the stop-motion characters that were shot on green screen. The site, built by L.A.’s Famous Interactive, also includes information specific to educators, underscoring that while PNC has created an endearing holiday dreamscape, the point of the project is offer a layman’s tool for comprehending financial data. So what is the total cost of Christmas for 2011? $24,263.18 for one set of everything, up 3.5% from last year. Watch the Making Of video below.